In November 2012, Scenic Hudson acquired a key 2-acre property that will provide its town with the first public river access in 100 years. This former marina will be transformed into a public park. Robert Rodriguez, Jr.
A Scenic Hudson conservation priority for 30 years, our acquisition of this property will enable the creation of a park providing public access to the Hudson River in the Town of Highlands for the first time in over a century. The land’s protection also has been a longstanding goal of Orange County, the town, fellow environmental groups and local citizens. 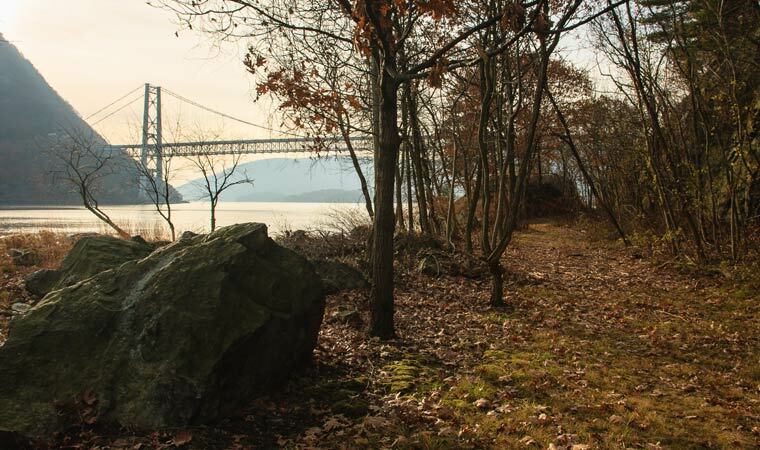 In addition to offering sweeping views of the river and Hudson Highlands, the property is highly visible from many surrounding public viewpoints, including the Bear Mountain Bridge and numerous parks and hiking trails. Its acquisition allows the demolition of several obsolete and unsightly structures, enhancing enjoyment of these world-class vistas. The land also adjoins Fort Montgomery State Historic Site, offering the potential to create a trail link. Uses envisioned at the park, to be developed and managed by the town, include picnicking, nature and local history education, fishing, launching boats and simply admiring the spectacular scenery. The purchase is part of Scenic Hudson’s collaborative campaign to Save the Land That Matters Most, preserving properties of the greatest scenic, ecological and agricultural significance.